Puerto Rico – officially, the Commonwealth of Puerto Rico (Estado Libre Asociado de Puerto Rico) – is an unincorporated territory of the United States that is located in the northeastern Caribbean, east of the Dominican Republic and west of the Virgin Islands. Geographically, Puerto Rico is composed of an archipelago that includes the main island of Puerto Rico as well as a number of smaller islands and keys, the largest of which are Vieques, Culebra, and Mona. 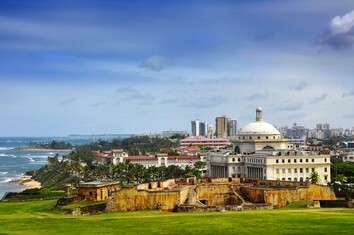 The main island of Puerto Rico is the smallest by land area and second smallest by population among the four Greater Antilles, which also include Cuba, Hispaniola, and Jamaica. According to a Special Committee of the United Nations, ethnically, the people of Puerto Rico "constitute a Latin American and Caribbean nation that has its own unequivocal national identity." Under the Constitution of Puerto Rico, the country is described as a “Commonwealth”. Puerto Ricans enjoy a degree of administrative autonomy similar to that of a U.S. state. Puerto Rico is classified by the U.S. government as an independent taxation authority by mutual agreement with the U.S. Congress. Contrary to common misconception, residents of Puerto Rico do pay some U.S. federal taxes: import/export taxes, federal commodity taxes, social security taxes, etc. Most residents do not pay federal income tax but do pay federal payroll taxes (Social Security and Medicare) as well as Puerto Rico income taxes. You will find incredible local arts and crafts, excellent rum, perfumes and fashions. Puerto Rico lies on a key shipping lane to the Panama Canal, the Mona Passage. Puerto Rico has a tropical marine climate, which is mild and has little seasonal temperature variation. Temperatures range from 21˚C to 32˚C, and tend to be lower at night and up in the mountains. The average annual temperature is 26°C. Hurricane season spans between June and November, where rain showers occur once a day, almost every day. Periodic droughts sometimes affect the island. The Cordillera Central, or La Cordillera Central (The Central Mountain range), is the main mountain range in Puerto Rico. Generally speaking, the range crosses the island from west to east with an average elevation of 915m (about 3000 ft) and divides the territory's northern and southern coastal plains. Dominating the headland of Old San Juan, the fort's 140 foot high walls tower above you, and provide protection against the elements as well as enemies. Starting in the main square, you can take a guided tour of the fortress, or using a map of El Morro. The statue of Columbus, which stands at the apex of the square, was sculpted by Angelo Racioppi, and donated by the New York City WPA (Works Progress Administration) Art Project. The seven-foot tall, bronze statue depicts a youthful Columbus standing at the helm of a ship. The Arecibo Radio Telescope features a dish set in a sinkhole. Here, astronomers have proved the "music of the stars"" (pulsars and quasars) and examine the moon, the earth's ionosphere, and other planets. Also, scenes from the Jodi Foster film Contact and others have been filmed at the observatory." Old San Juan is located on a small and narrow island which lies in the north coast and is united to the mainland of Puerto Rico by the three bridges. On a bluff about 100 feet (30 m) high at the west end of the island and commanding the entrance to the harbor rise the battlements of Fort San Felipe del Morro, in which there is a lighthouse. The Cathedral of San Juan Bautista is a Roman Catholic cathedral in Old San Juan, Puerto Rico. The cathedral is one of the oldest buildings in San Juan, and is the second oldest cathedral in the Western Hemisphere. The cathedral contains the tomb of the Spanish explorer and settlement founder Juan Ponce de León. El Yunque National Forest, formerly known as the Caribbean National Forest is located in the rugged Sierra de Luquillo. The forest covers lands of the municipalities of Canóvanas, Las Piedras, Luquillo, Fajardo, Ceiba, Naguabo, and Rio Grande. It is the only tropical forest in the United States National Forest System. Museum of Art of Puerto Rico is one of the few museums of art in Puerto Rico. The historical building that houses part of the MAPR was built around the 1920s by architect William Shimmelphening. A new wing was added to the existing building to create what is now the complete structure. Fortín de San Gerónimo del Boquerón is a small fort located in the entrance to what is known today as Condado Lagoon in San Juan, Puerto Rico. The San Gerónimo became part of San Juan's First Line of Defense, along with the San Antonio Fort/Bridge and Escambrón Fort, guardian to the city entrance.